Being known as the neighborhood grill master is an honor. 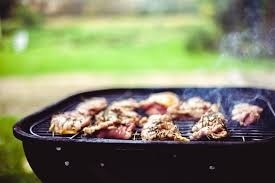 As a kid, I have always admired the person who ran the grill; the person who delivered the best tasting food. To decide whether I wanted to go or not was dependent on one question: Who is cooking? Unfortunately, I am not revered as the grill master yet. However, I found these 3 recipes which are easy but deliver awesome tastes. Although these are simple, I have learned that cooking the simple things great is enough to win the crowd. Before you dismiss this seemingly basic idea, remember the times you have tasted dry, flavorless chicken at your last get-to-together. Chicken is a simple dish to serve, but I have had my fair share of dry chicken that needed to be washed down with each bite. With this recipe, you can serve moist, tasty chicken without going too extravagant. Purchase one whole chicken and cut into 6 to 8 pieces, depending on the serving sizes you desire. Use some salt and pepper to season the chicken, then throw it on the grill. Turn the chicken about every 10 minutes. It should take around 30 minutes to be completely cooked, depending on the sizes. Lower the heat of the grill and baste one side of the chicken pieces with BBQ sauce. Allow it to sit in the grill for 5 minutes then flip each piece and repeat the process. Your mouth-watering BBQ chicken is ready to serve. It is not a BBQ without ribs. These are a definite must to master. Serving great ribs brings you a step closer to becoming the grill master. However, this one is going to take some time to prep. For this recipe, you will need about 4 pounds of beef spareribs. Rinse those ribs and completely dry them. Cut off all the thin fatty skin. Then, trim the ribs of any excess fat. Go ahead and season both sides of the ribs with some salt and pepper. After, you are going to wrap up the ribs and put them in the refrigerator for about 8 hours. Cook this recipe with the cover down, keeping the heat lower than normal. Put the meatier side of the ribs on the grill. Cook them for about 2 hours before turning them over. Cook for another 45 minutes until the meat separates easily from the bone. When it’s done, coat the ribs with BBQ sauce. Now, the Memphis-Style Hickory-Smoked Beef Ribs are finished! It is not very common to see salmon being served in the BBQ’s I attend. I am a huge fan of fish, though. So, I recommend this dish to shake things up a bit. First mix; 1 cup of salt, ½ cup of sugar, ½ cup of brown sugar, and 1 tablespoon of crushed black peppercorns in a bowl. Lay out plastic wrap and cover it with 1/3 of the rub mix. Place 2 large salmon, with bones removed, on the plastic wrap. Rub the rest of the mix on the skin of the salmon. Wrap the plastic around the fish and put it in the refrigerator for 12 hours. Flip the salmon for another 12 hours of refrigeration. Don’t worry, the wait is worth it. Take out the fish and unwrap it, then rinse with cold water. Let the fish dry for about 2 hours. Finally, the fish is ready to cook. Place on the grill until the thickest part of the fish is cooked. Serve it right off the grill with a splash of lime juice if you want to add an extra kick. Each recipe is inspired by foodnetwork.com, so check out their site for more details and amazing recipes.